Elaine Dunham oil and wax abstract art. Dana Gronemyer oil and wax abstract art. Dana Gronemyer oil and wax abstract. Elaine Dunham oil and wax abstract. 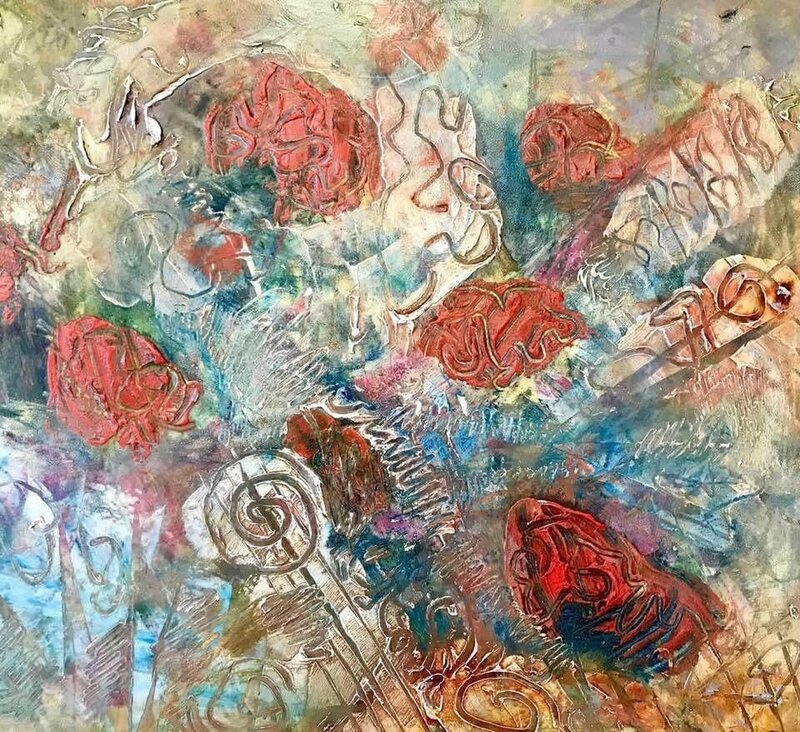 COQUILLE — Kindred spirits and creators of Abstract Art, Elaine Dunham and Dana Gronemyer, will exhibit at God's House of Vision Gallery and Studio in Coquille. You will find their abstract art there created primarily from a cold wax and oil through February. Their opening reception will be held 6-8 p.m. at God's House of Vision located at 10 E. First St., in Coquille. When Elaine Dunham’s youngest son left for college in 2012, she became determined to reclaim her hibernating passion for drawing and painting. She spent time in every studio class she could at Coos Art Museum. Though none of Elaine’s degrees is in art, she has taken countless classes in drawing, painting, and printmaking throughout her life, so she never claims to be self-taught. Dunham says a 2015 class at Coos Art Museum entitled “Experimental Drawing,” taught by artist Pat Snyder, changed her life. Freed by that class to move and express rather than merely create figural pictures, she eagerly paints almost every day, every painting an abstract experiment. She had been painting primarily in acrylic but most recently immersed herself in explorations with oil and cold wax. All of her paintings in this show were made using mixtures of oil and cold wax medium. Elaine’s paintings have been juried into three shows at Verum Ultimum Gallery in Portland: Abstract Sanctuary 4, the fourth annual Living Mark, and Abstract Catalyst 5. One of her paintings also was juried into Expressions West 2017 at Coos Art Museum. She's had September through October shows at Black Market Gourmet in Coos Bay in 2016, 2017, and 2018. In November and December of 2017, several of Elaine’s paintings, along with paintings by Geralyn Inokuchi and Sharon Jensen, were in an abstract exhibit at the Hawthorne Gallery in Port Orford. Six of her paintings are currently hanging in a popular and healthy lunch spot, Noster Kitchen, in Coos Bay. 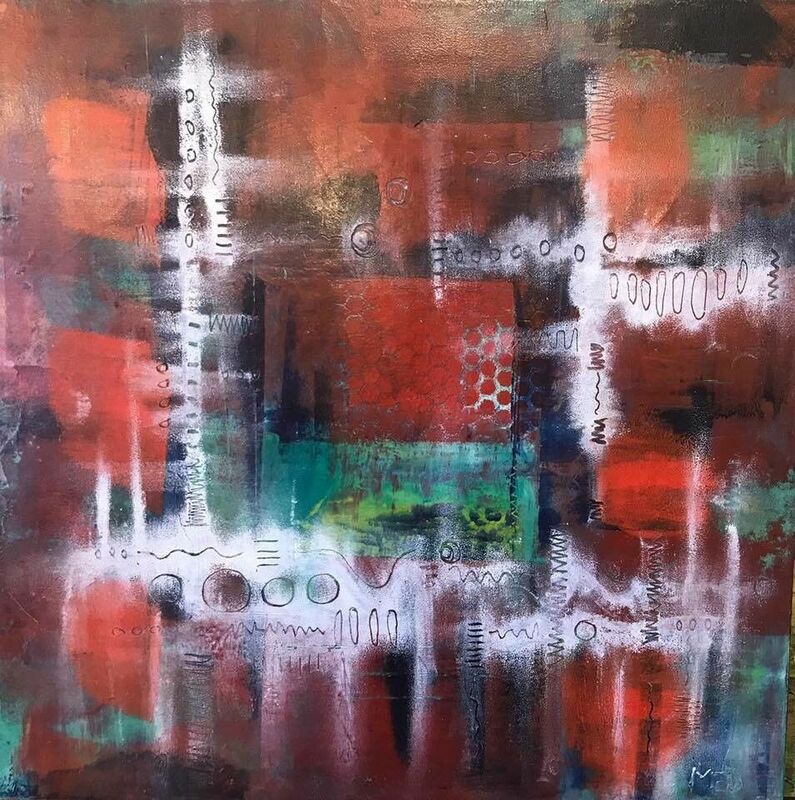 In May 2019, Elaine’s work will be at the Red Door Gallery in Roseburg, in an abstract show also featuring works by Geralyn Inokuchi, Sharon Jensen, and Susan Lehman. Dana Gronemyer has had a lifelong love for art and making art — classes, courses, and workshops, from life drawing, pottery, paper and printmaking to collage, calligraphy, watercolor and acrylic. Gronemyer says I admire realism, but my heart is with impression, expression and abstraction. I have studied with Carol Vernon, Liv Drahos, Pay Snyder and Zoe Cohen and most recently, Serena Barton. Many of the pieces in this show are worked in the cold wax and oil technique explored in a summer workshop with Serena Barton. Oil colors are mixed into a colorless wax medium of beeswax, solvents and resin. Layers of color are applied with a squeegee and then manipulated by scratching, marking or removing with solvent, slowly building depth and texture. The possibilities are seemingly endless. The final result is coated with thin layers of wax medium and polished when dry, allowing the layers of color to appear to float. This is my play — layers of light, color, line and texture are my expressions of play, evoking fleeting emotions that change as another layer is added. My art is influenced by observation of the layers of fog, mist and light that I view on my morning and evening drive between Coquille and Coos Bay. I am pleased if you enjoy what I have created. Gronemyer has been a part of the team at Art Connection for 20-plus years and has been influenced by viewing wonderful art and meeting artists there. She has learned framing skills and collected many, many art supplies along the way. Still there is more, more techniques, more materials and much more framing to do.